Some stuff I’ve made recently. 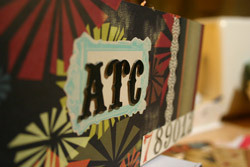 Finally got around to covering my ATC book. Seriously, I’ve had this book for maybe a year now, and it’s already filled. I am THE WORST at sending cards for people. 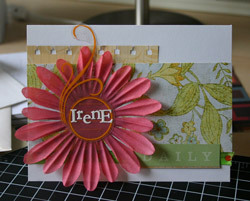 But I got around to sending my friend, Irene, a card for birthday. Hugs to you, Irene! And this layout here… my goal was to make a fast layout before ANTM started. 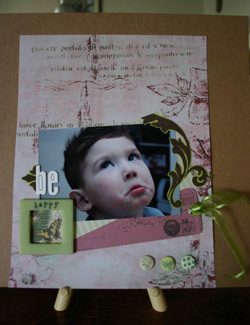 I made two, this is the only one I’ll show, because the other one is HIDEOUS. 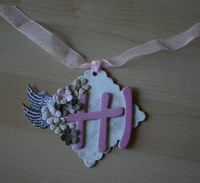 And here’s one of a couple of tags I made for a charity donation. Note to self, read carefully before signing up for stuff. you don’t want to spend $20 to priority mail 2 small tags to Singapore? geez. these are great sista! that card is so pretty.. why don’t you ever send me cards? I’ve decided that you need to come out here. 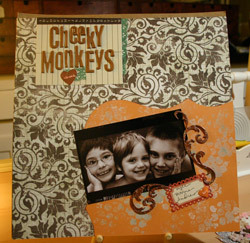 I don’t care .. i’m gonna sneak you from mom and dad..
love that layout at top of your nephews! and that atc books cover is super fab. i have one of those and i should totally get around to actually putting some of the atc’s i have lying around in sandwich baggies in there, hunh? wow! you’ve been very busy. love all your stuff! 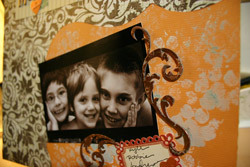 I am going away at the end of this month for a girls’ scrapbooking weekend, so I plan to work on our photo swap LOs! How about the new “cycle” of ANTM? Awwww these Lo’s are super cute… You’ve been super super busy…! I love seeing these crafty things…….being absolutely rubbish with my hands and not having an artistic eye, I have never been able to do ‘scrappy’ stuff.